Hello, there. I work for Insomniacs. For those of you who don’t know what that is, you should. Especially if you work in the vast spectrum of digital marketing. It is a digital agency founded by, as the name suggests, a couple of insomniacs. The company thrives on teamwork and efficiency and etc, etc, etc. Are you bored yet? I am. And if there’s one thing I know from my time working with Insomniacs, is that there’s no room for boredom. Or sleep. So, instead of drowning you in data and un-quantifiable adjectives like “efficient,” let me explain to you what it’s actually like to work with a young, creativity-driven digital agency that doesn’t sugarcoat things. At Insomniacs, I learned very quickly that you won’t be stuck under the enormous weight of hierarchy, also known as corporate slavery. Interns and department seniors alike, have a voice here. You won’t just be a nameless, faceless, coffee-fuelled robot ready to dance at your boss’s beck and call. You have a say in how things work. Your ideas and opinions count. The work environment is quirky, to say the least. Imagine a sleek, monochrome office that looks like it’s right out of a chic decor magazine. Imagine people in immaculate suits, all so well-dressed that you can’t tell them apart. Imagine pristine floors, and the atmosphere so silent that you can hear your shoes click loudly as you walk. Now take this picture and toss it in the garbage — because Insomniacs is everything that it’s not. Trust me when I say this – everyone who works at Insomniacs is insanely individualistic. The office is loud and chaotic, sometimes insanely so, with people brewing concepts and ideas faster that they brew their coffee. You’re going to learn the value of a good night’s sleep. True to its name, the company works relentlessly to reach and surpass its goals. And, yes, I’m aware that every company says it does the same, but I can personally vouch for sleepless nights, the missed meals, the utter insanity. But don’t worry, we have a lifetime contract with Subway for the daily orders they get from us and certain Saturdays are designated pajama-to-work days. You get a ton of creative freedom. 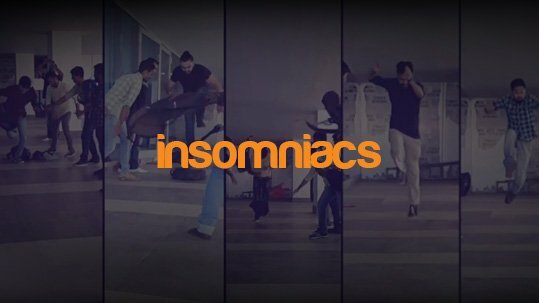 Insomniacs believe in giving its creators all the freedom and resources they need. Every employee here is like Da Vinci on coke. You have good idea? Awesome. You have an insane idea? Even better. We don’t let convention bar us from attempting new things. Most companies, regardless of their high-end tech, don’t know how to utilize it. The IT department sits around the creative team’s desks explaining things like you would explain Facebook to your ninety-year-old grandmother. Insomniacs not only cultivates but completely utilizes the high-end technology to its full potential. When it comes to our tech, we know what we’re talking about. Oh – and we’re hiring. If all of these things above sound like they’re up your alley, then you should consider applying.